I’m back in Barrancabermeja after a couple of month break for my second year with PBI. The big news is Pitalito. The team have already been accompanying the community for almost a month by the time I head off with my fellow volunteer Yoris, and so far it certainly hasn’t been boring! When two of my colleagues accompanied the Committee in Solidarity with Political Prisoners (FCSPP) on the community’s initial return to Pitalito they had a rather sleepless week: keeping guard at night; surprise visits from the military at dawn to see Pitalito´s return for themselves; and visits to and from the municipal capital (by boat) to accompany the lawyers on legal business. However, after the first week things had calmed down a bit, but we still felt that maintaining an international presence was important to ensure the safety of the community in case people tried to forcibly displace them, as they had in 2010. I´ll be honest, I was a little nervous. I like going to terrain, and I knew that it would mean camping for the entire week. I also knew that it would mean bathing in the river which is always fun, and eating a lot of yucca, sometimes three times a day, which well… it’s that or go hungry. I was scared of two things: one, snakes (bring wellies! ), and two… the lack of toilet. On their own these things are manageable, but when there is a serious risk of getting your bum bitten by a snake, you tend to avoid toilet breaks. However, I put these things to the back of my mind. This was going to be an adventure! I´d seen photos of the previous accompaniments, and when the community had first arrived it had been nothing but a clearing in some trees. When we arrived I was struck by how much things had changed. I´d seen photos of the previous accompaniments, and when the community had first arrived it had been nothing but a clearing in some trees. 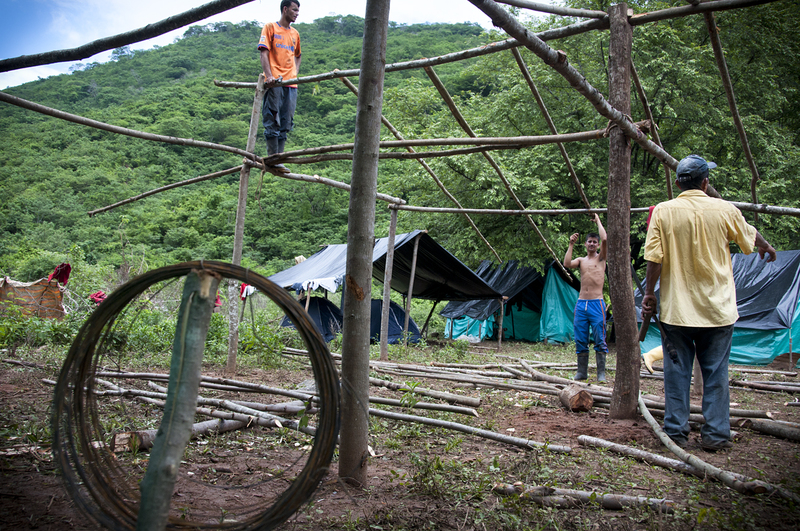 However, since then, the makeshift shelters had become large solid tents, the cooking area had a roof, and there was running water for a kitchen sink and a shower. Tomato and yucca cultivating had begun and the community had got into a daily work routine that finished every night with a meeting. Everything was done collectively which was also quite exciting since it really gave it the feel of a project that everyone was building together, keeping everyone motivated. It was really quite special. These different families had been displaced just three years ago, and here they were, back on their land, united, determined to stay and were actually stronger for it! And what a night it was! I think until that point people felt that we were the only thing between them and a forced eviction. When they saw the amount of support they had for their project beyond the borders of Pitalito, their motivation and the belief if their project grew. No one was going to be displacing them illegally anytime soon- they could start to think beyond the next few days and start planning long-term. International support showed them that the comunidad campesina de Pitalito project wasn´t an ambition anymore, it was a reality. At night we would take it in turns to guard the entry into the community for an hour or two, whistle at hand to wake up the community if necessary. Some nights it was just be me and Yoris debating the ethics of international accompaniment , other nights Rommel would be there entertaining us with stories of court cases he´d worked on (you have to hear it to believe it! ), and sometimes some of the Pitalito inhabitants would be there. One particular night I remember one of the young men telling us about the Madre Monte, a legendary figure that lives in the hills surrounding Pitalito who would force men to marry her if they were badly behaved. And this was no joke, it had happened to some brothers who lived in the next valley along. It was an absurd conversation, but it also highlighted how far Pitalito´s situation has come. 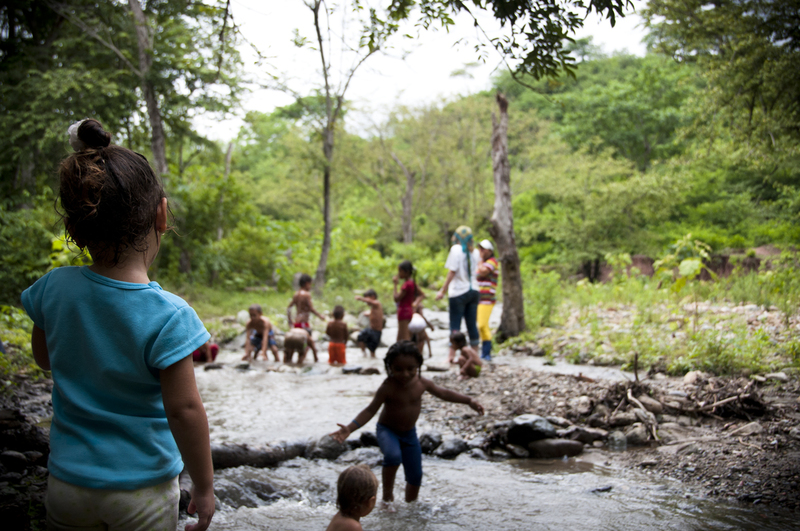 If the Pitalito community´s most immediate worry for the time being is the Madre Monte, and mine are the snakes, then we´ve come a long way. That´s not to say the threat of being displaced has disappeared, but it´s not as imminent as it was when the community returned in May. I´ve been back to the community twice now. I´ve seen two and a half snakes (one was dead, killed by one of the kids) and survived them all. The Madre Monte is still out there but so far hasn´t made an appearance. My colleagues who have been back since tell me the community has now got fully grown tomatoes and a working toilet, so I´m excited to go back this month and see them for myself. Things really are going from strength to strength. Sophia Kerridge has been working with PBI in the field since January 2012 both in Bogotá and Barrancabermeja. She is from the United Kingdom. Good story. I gladly shared it on Facebook. With joy I read you article about the community of Pitalito. As one of the Colombia country specialists it’s my time to write an article about Colombia to post on the website of OneWorld.nl next month. When I read your article, I got the idea of writing a positive article, a bit of a succes story, something that shows how our volunteers participate in helping those people to fight for their rights and give them strength to hold on. And that it makes a difference, that people really accomplice things. That’s why I wanted to ask you if I could use your story for this (ofcourse in a way that I write down that those are the words of a volunteer out of the field) and maybe you could provide me with the latest news? In case anything new is happening. Hope to hear from you soon. Thank you allready! seeking more of your magnificent post. Also, I have shared your site in my social networks!